Americans bought more new cars in 2015 than ever before. Here's why: Low gas prices, easy credit, strong job growth, and pent-up demand from years of depressed sales. Automakers reported another month of strong sales for December, taking full-year sales to nearly 17.5 million cars and trucks, according to figures from sales tracker Autodata. That's up about 6% from 2014 and just edged out the previous record of 17.4 million set in 2000. December sales posted an even stronger gain, likely up about 10% when final figures are reported, although that was a touch weaker than forecasts for the month. It's a dramatic rebound for an industry that was on life-support six years ago. In 2009, massive job losses and tight credit sent car sales plunging to only 10.4 million. General Motors (GM) and Chrysler Group ended up in bankruptcy. 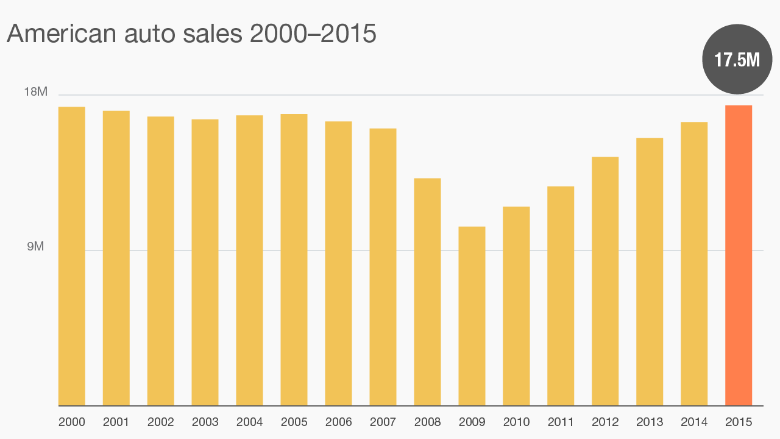 Sales have climbed steadily every year since then. In 2015, a major factor in the sales rebound was strong hiring by employers, who added some 2.3 million jobs. The growth in auto sales is expected to continue in 2016; most forecasts put sales this year above 18 million. Ford (F) CEO Mark Fields said the age of the current fleet of cars and trucks shows there is still many buyers looking to replace vehicles that are 10 years old or older. "We think the next couple of years are going to continue to be very healthy ones for the auto industry," he told CNNMoney. Sales helped to produce record profit reports at GM and Ford (F) earlier in the year. Automakers are also selling vehicles at record prices. Consumers are demanding features that weren't even available a decade ago, from automatic braking to Internet connectivity. Low gas prices have reignited Americans' desire to buy SUVs and pickups, which are typically sold at a higher price than sedans. 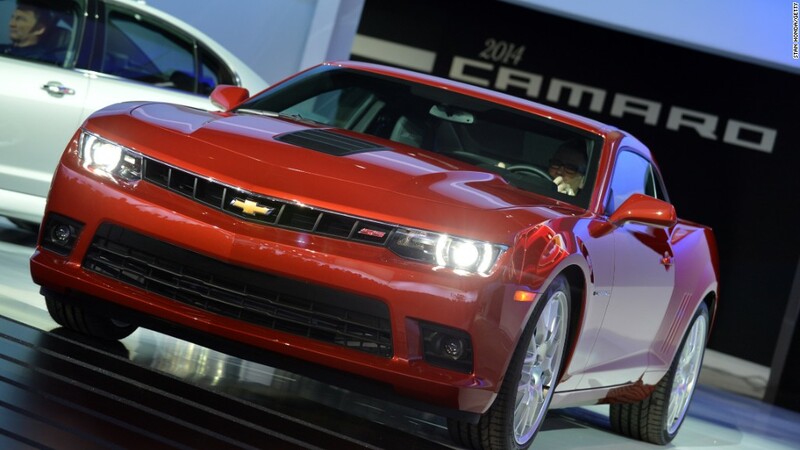 Kelley Blue Book estimates that the average sales price reached a record $34,428 in December. And with all the buying comes borrowing. Balances on car loans topped $1 trillion for the first time on record in 2015. Rates are expected to stay low. The gains were broad based, with every automaker posting improved full-year sales. The worst performer in the industry was Volkswagen AG, hit by an emissions cheating scandal that halted the sale of its diesel models in September. U.S. sales at its Volkswagen brand were down 5% for the year and 9% in December, and it needed a big jump in cash offers to keep sales at that level. But improved sales at its luxury Audi brand allowed a slight gain in companywide sales for the year.